Question-Is there a secret Court House or DMV that normal people get invited to that I don't know about? Whenever I have to go to the DMV or jury duty, I feel like I am the only normal person there. The courthouse is a magical place where stereotypes come to life. You first get called in and have to wait in a waiting room all day. The place smells like cigarettes, B.O., CK1 and Ross department store. I actually almost turned to the woman sitting next to me and asked her if she used a fork and knife this morning while eating poo, her breath was so bad. Anyway you wait in this room for hours while some lady announces names and recites jokes from George Lopez she watched last night. I thought the South West airlines jokes made me want to punch those khaki-short people in the face--this was worse. The lady talked exactly like Jennifer Lopez but wasn't the eye-candy. They do offer you year old magazines with the sudoku and crossword puzzles poorly half accomplished, and there are 3 computers with solitaire, maj-jong and pin ball. They are of course taken like the slot machines at Vegas with non-blinking, red-eyed addicts. I especially love pinball because there is zero skill, but man this one guy was so intense I found myself cheering him on inside. He was determined not to let that ball get passed him (by the way I have always wanted a real pinball machine-which has nothing to do with anything). Most people brought books which I forgot, so I just stared at people all day, which probably made me the creepy white guy. I was thirty minutes away from being dismissed for the day when they finally called my name. I yelled a little and then made my way upstairs. It was almost 4:30 so they "kindly" dismissed us and told us to come back tomorrow morning for jury selection--I hate that crap so bad. I went back the next day and hoped not to get selected. It ended up being a domestic violence case; I thought I'd be real sneaky and let the jury know that my mom is a social worker for a domestic violence shelter; I was sure they wouldn't want me on the jury. That theory backfired and the attorneys asked me a bunch of questions and I of course got, not only selected for the jury, but was the foreman on the case...and was actually really glad I did it! This was such a great experience. First off I need to apologize to my attorney friends (Blake, Scott, Tim, etc) because some of these attorneys make the bar seem like it was as difficult as testing to work at a temp agency. On a totally superficial note--these attorneys have to make decent money, can't they at least buy a suit that fits, not one that came straight off the rack of Men's Warehouse? They looked like they borrowed their dad's suit that was twice their size. Secondly, I think there is a female attorney suit store that only sales black or grey suits that make these women look like German militia meets Super Nanny. We get it, you're smart, you passed the bar...loosen up a little or at least your bun. I thought I was going to get kicked out of the courtroom for sure because some of the comments that these witnesses make were killing me. In this case, the woman was watching a movie with her boyfriend and he made an offhand comment about one of the women on the movie--she replies that she is going to "cut his 'bum' " (I'm censoring for the children). She runs to the drawer to get a knife and he tackles her, they wrestle, she runs out to her car and calls 911. There is obviously more to the story, but this blog is already long enough. The woman claims he hit her in the face and threatened her life. They called this lady to the stand and the fun began. It turns out that this woman had beat up his friend Lakisha (why is there always a Lakisha involved?). The attorney asked this woman if she remembered calling Lakisha a, "stringy "bummed", half Asian, crack whore, blankety blank, blank, blank, blank, blank....." I lost it, I had to put my head down and started laughing. I mean the sheer length of this insult was almost poetry...urban poetry, but it was poetry in its truest form. She proudly replied, "Honey you know I did and I kicked her "bum" too." I couldn't have been enjoying myself more. In all seriousness, it was actually a neat experience to see our legal system in place. 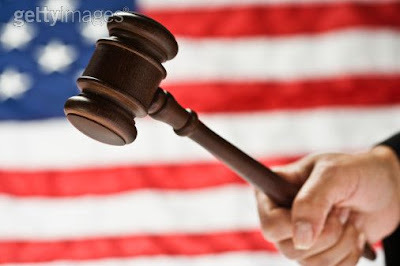 I felt justice was served and I would gladly serve on jury duty again. If any of you want the unabridged/unedited version of this story please feel free to visit, I would love to retell it in all its deserved glory. My civic duty has proudly been fulfilled for a year. Thank you. And to think I spend each and every day counseling victims of Domestic Violence while my son is defending the abuser :) Please don't send Lakisha my contact info. Love it. Laughed out loud. I'd like the long version sometime, seriously. It'd be a fun evening. I would first like to publicly thank Erica for giving me your blog address. For which, I am eternally grateful. Secondly, I would most definetly like to be signed up for the long version of this story. Thirdly, Ryan... let's get crackin on a "massage etiquette" blog ASAP! Seriously, where do these people come from? You haven't had emergency room experience yet but they are there too. Glad you managed through all the craziness to see the beauty in our justice system. Jury forman! -you made Bob very proud! I'm just a dude whose wife stumbled upon your blog and told me it was really funny and that I had to read it. She was right. Super funny. aaaaaaaaaaaaaHAHAHAHHAHAHAHHA. I'm dying laughing right now. SOoooo good.